Triathlon is challenging. You have to work hard at three disciplines and be motivated to sustain yourself from training stage to executing the project successfully. Aspiration to try Ironman events follow. 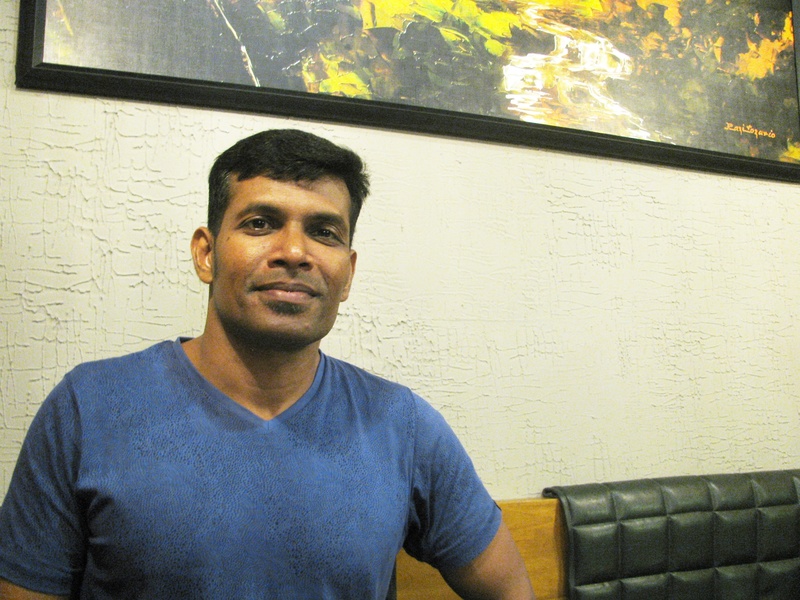 This is the story of Kochi’s Joby Paul; woven into it are the experiences of others too, who did the triathlon. At the café we walked into, Joby Paul seemed known from previous reports about him in the local media. Well-built and driving a Skoda SUV, he was considered the first person from Kochi (based in Kochi, that is) to complete an Ironman event. It was late summer evening and a drizzle graced the road leading to the cafe near Thrikkakara. It reminded me of how similar and yet dissimilar, places on the Indian west coast are. Both Kochi and Mumbai are port cities. That’s all the similarity there is. As ecosystem, I suspect, Kochi is closer to the sweep of green, coastal ambiance that terminates at Goa and southern Maharashtra. You sense it in the setting of these new cafes – motifs of modern lifestyle tucked into what are otherwise longstanding, residential neighborhoods. Closer to Mumbai the greenery and intimacy vanish. How long, Kerala’s greenery and ecosystem? – I often wonder. Freelance journalist drew out note pad and pen and settled for a cup of his regular – coffee. Joby was born 1982 at Onakkoor, a village tad south east of Kochi, some 35 kilometers away from the state’s commercial capital. He hailed from a well to do family; his father owned land with rubber trees on it. Kerala accounts for the bulk of India’s rubber production with the district of Kottayam, adjacent to Ernakulam in which Onakkoor is, contributing the most within the state. In terms of geographical positioning, rubber is usually grown in the lower hills. Joby was an only child. Active at sports in school, from the eighth standard onward was into martial arts. Moving on, at BPC College, Piravom, he was “ Mr BPC’’ for three years. “ I was conscious of physical fitness,’’ Joby said recalling his days in school and college. He didn’t smoke or drink. Following MSc from a college in Tamil Nadu, he took up his first job at OCL Informatics (at that time, part of OEN Connectors; since taken over by Ideonics) in Kochi. After seven years there and a MS (Software Systems) done as off-campus corporate program from BITS Pilani, he commenced his own company – Reference Point Technology Services. Building his company, Joby used to travel to the US on work assignments. On one occasion he was there for a month, based in Puerto Rico, which is an unincorporated territory of the US. “ That was the first time I became aware of a culture of endurance sports,’’ Joby said. The idea of localities and communities supporting endurance sport was not only new to him; it also lingered in mind, a growing fascination. On return to Kochi, Joby started to run. To sustain the effort, he asked around for a group. He found Soles of Cochin. He joined them around November-December 2014. When he was in the US, Joby weighted approximately 90 kilos. Around the time he joined Soles, he was in the region of 80-85 kilos. Soles introduced him to the finer aspects of running. It wasn’t just getting up and going off for a run, there was the stretching, training, handling of injury, cross-training. There was a world around running. It opened up. Then, there is the never ending debate if which is better – running with shoes or without? Joby got into barefoot running. To cross-train, he got into cycling. “ Soles has groups for all this,’’ Joby said. 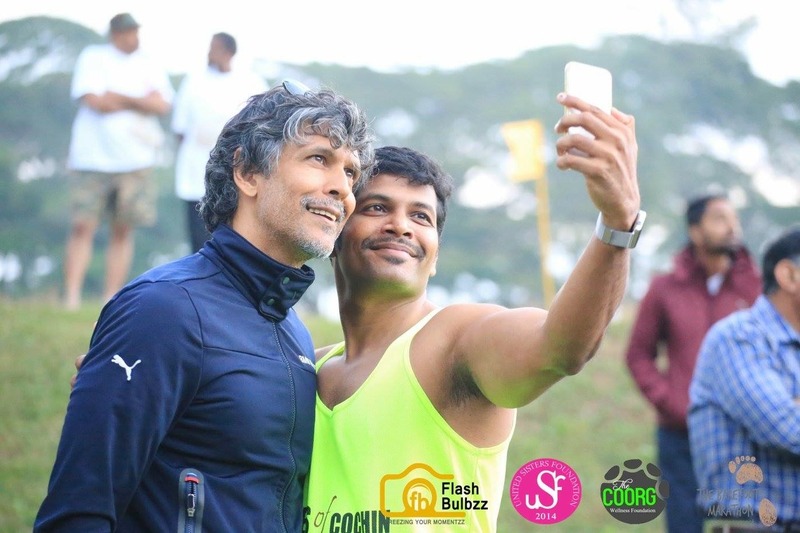 In 2015, at a barefoot marathon in Coorg, Joby met Milind Soman, a versatile individual who has been model, actor, swimmer, triathlete and ultramarathon runner. The latter spoke about Ironman. Joby got hooked to the idea. On return to Kochi, he commenced collecting information on the triathlon and therein, Ironman. He had working knowledge of running and cycling. Swimming was weak spot. The swimming he was used to was learnt in the pools, ponds and rivers of Kerala. It was strictly functional and had no elegance to it. Kicking and splashing water all around was integral to this style. Elegance may smack of avoidable embellishment but in swimming, good style is what reduces friction and makes you hydrodynamic. His old swimming technique took Joby a maximum of 50-100 meters. When you have to swim long distance as you do in a triathlon, evolving a good style that cuts drag, saves energy and helps you keep going, is important. The first challenge in swimming therefore was to unlearn whatever he had picked up so far. In the time that lapsed since he joined Soles of Cochin, Joby began identifying more and more with the group. “ Crazy’’ – he used that word often to describe Soles; another word being “ hyperactive.’’ It appeared to paint the image of a group that was dynamic, wanting to attempt things, supportive of its members and encouraging them in what they wished to do. Joby’s first half marathon happened roughly a year after he joined Soles. 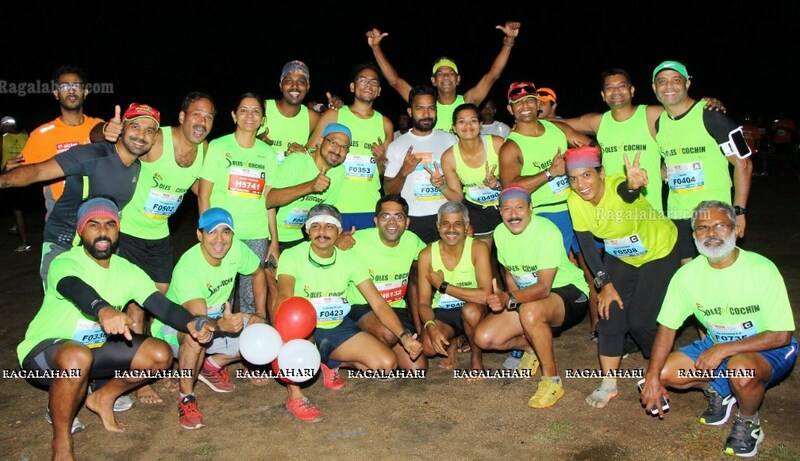 It was the half marathon segment of Spice Coast Marathon, an event commenced by Soles and since grown into one of South India’s major marathons and a Boston qualifier to boot. He completed this run with a timing of 2:06. His first full marathon was the 2016 edition of TROT (The Run of Raramuri Tribe) Marathon in Bengaluru, which he completed in 4:50. In India, land based sports have always enjoyed upper hand. For various reasons, affinity for water and certainly the sea therein, has been less. Thus while many people readily take to running and cycling, fewer numbers embrace water and sea. It is a puzzling scenario for geographically, India has a seacoast that is 7500 kilometers long. That’s nearly three times longer than the mountains up north dominating the subcontinent’s imagination. There is also one aspect about swimming, which strikes you as you behold it in Indian context, where the tendency of people to be in groups is very high. Swimming, even when practised in the restricted confines of a pool, envelops you in a private cocoon. In contrast, it is very common to find runners out in groups; often running and talking at once. In January 2016, Naushad Asanar, who is a longstanding member of Soles of Cochin, completed a triathlon in Goa. It was the first time somebody from Soles did a triathlon. Naushad grew up in Thiruvananthapuram. His house there was close to the local swimming pool. While in the fourth or fifth standard at school, he had been packed off to attend coaching classes (they happen during the summer vacation period) offered by the Kerala State Sports Council at the pool. That and living in proximity to the pool enabling frequent swims, laid a strong foundation to his competence at swimming. However, as an adult – now working in Kochi – his interest in swimming hibernated. Till; his daughter enrolled to learn swimming. The venue for instruction was the Periyar River and with parents expected to accompany their children, Naushad went along. It was opportunity to brush up his old skills. In due course he accomplished a crossing of the river. It made him confident to do open water swimming. That was how Naushad’s journey to the triathlon in Goa, commenced. Following that triathlon, Naushad became Joby’s initial tutor on how to tackle swimming. To practise, they chose Thirumuppam kulam, a large public pond, in Varapuzha, some 15 kilometers away from Ernakulam. “ It is a fairly large pond. Thanks to the interest of local authorities, it is also well maintained,’’ Naushad said. A perimeter swim here is roughly 350 meters long. Becoming competent to swim those 350 meters was Joby’s first target. For company, he had Naushad and other runners from Soles who had embraced swimming to cross-train. Naushad remembered Joby from those days. “ Joby was physically strong. But his swimming technique was inefficient. What works in his favor is that once he sets his mind on doing something, he goes after it systematically. He worked on dismantling his old style of swimming and acquiring a better one. He works hard,’’ Naushad said. During this phase, Joby had a client in Bahrain. He used to travel to Bahrain on and off on work. 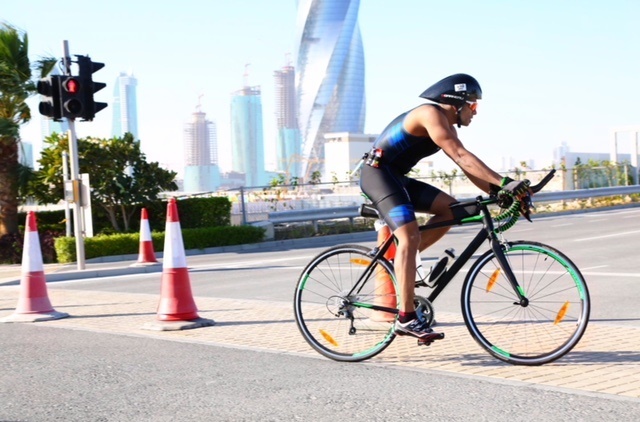 Bahrain had a half Ironman event – it entailed swimming 1.9 kilometers, cycling 90 kilometers and doing a half marathon. Naushad suggested that Joby attempt it. The event was in December 2016. 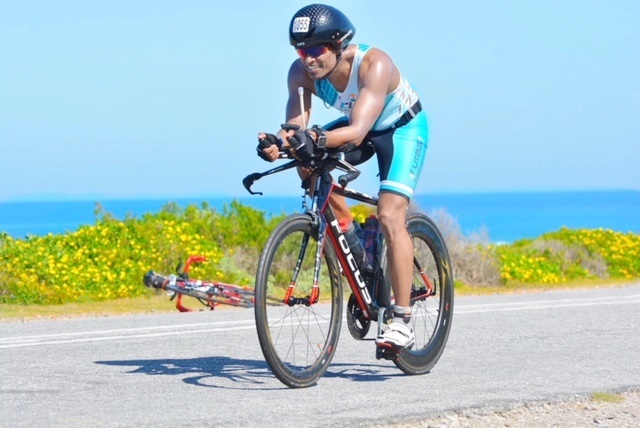 In one of those unexpected supportive twists of life, the Bahrain-based client, upon learning of Joby’s plan to attempt the local half Ironman and consequent need to train for it, offered to buy him a road bike so that he could train while in Bahrain on work. Joby registered for the event. “ Once you register for an event, there is no turning back. You are committed,’’ he said of the approach he has since come to believe in. However, that predicament of no turning back wasn’t something he intentionally did. Fact is – after he registered, his friends at Soles started talking about it. “ Now there was genuinely no going back,’’ Joby said laughing. The registration also made him more focused during his swim sessions at Varapuzha. In a month’s time, he managed the 350 meter-circuit of the pond. Still, swimming was what he required to work on. “ I was confident I will somehow manage the running and cycling. Swimming – I had no option but to train and improve,’’ Joby said. Meanwhile, every month for four to five days, he was in Bahrain. There, he cycled in the morning and evening on the Scott road bike that the client – Vin Technologies – got him. In Kochi, he trained on a Scott hybrid. 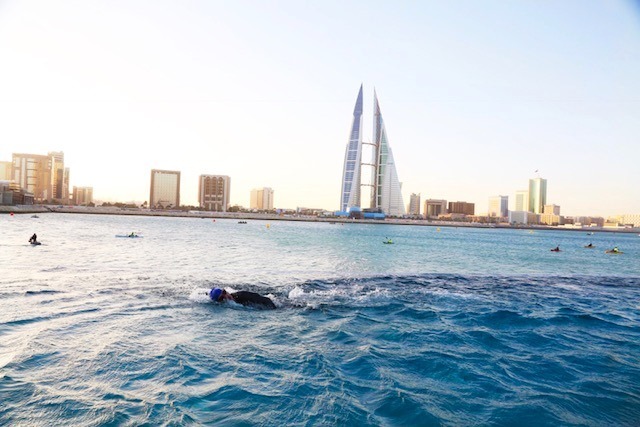 Two to three months after registering for the Bahrain Half Ironman, Joby was managing 1-1.5 kilometers nonstop at swimming. “ It made me confident,’’ he said. Working at the specific disciplines – running, cycling and swimming – which triathlon entails, wasn’t the only thing Joby had to do. Broadly speaking, 50 per cent of emphasis went into training volume to build up endurance with the balance 50 per cent, divided equally between strength training (including gym, yoga and stretching) and nutrition. Joby cut out junk foods and sugar. For the morning half of his day, he made his food intake carbohydrate-rich. The evening half, he made it protein-rich. He also took vitamin supplements. The Bahrain Half Ironman was scheduled for December 10, 2016. That day, it was relatively cold and windy. Minor details in preparation started to worry. For instance, all of Joby’s training – including swimming – had been in warm conditions. He had acquired a wet suit specifically for the event; it was bought by a client in the US and dispatched to him. He had tried it out at the pond in Varapuzha. But in the warm weather of Kerala he couldn’t wear it for more than ten minutes. So the wet suit was also in many ways, an unfamiliar quantum. Mercifully, the 1.9 kilometer-swim at the half Ironman went off alright. It was in cycling that Joby suffered setback. He came down a bridge fast. There was tailwind and as he turned right, the wind knocked him off balance. He crashed. The front wheel of the bike was bent, a tyre was punctured and one of the aerobars broke. He suffered injuries. It was kilometer 45. He rested for ten minutes. The quickest way to inflate a punctured tyre is to use a carbon dioxide cartridge. They are small and easily carried by rider. However, the procedure has to be managed carefully. Since the gas is stored under high pressure in the cartridge, when released, it fills the tube fast. If the tube has been stuffed back in improperly, chances of rupture are high. There is also the need to handle the cartridge carefully. As the gas escapes from cartridge to tube, the cartridge can turn painfully cold. Joby inflated the tyre afresh with the carbon dioxide cartridge he had and fixed the wheel back. Because it was still slightly bent, the rim kept rubbing against the brake pad. To overcome the problem, he removed the front brake. The rest of the ride was therefore slow. The running that followed the cycling was painful because sweat kept pouring into all the scrapes and skin abrasion he had suffered in the crash. He finished the half marathon in two hours, four minutes. On finishing, his friends from Vin Technologies took him straight to hospital to get his injuries addressed. 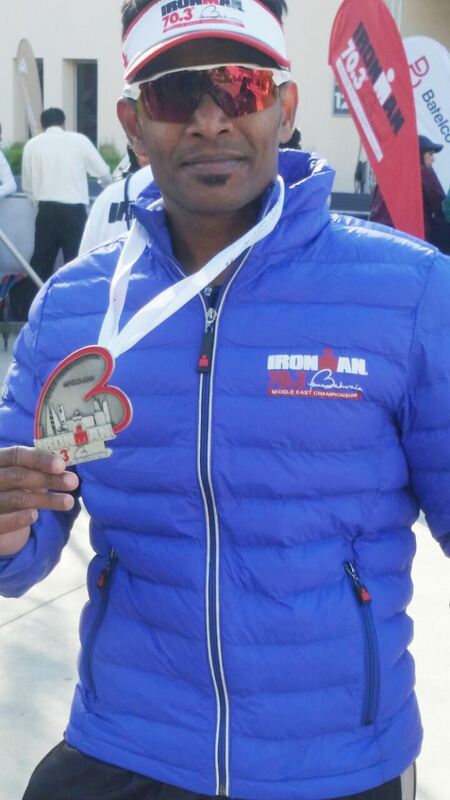 Overall, Joby completed the Bahrain Half Ironman in six hours, 40 minutes. The half Ironman boosted Joby’s confidence. “ At Soles people started encouraging me to attempt a full Ironman,’’ he said. 2016 saw Joby run full marathons in Bengaluru and Hyderabad. Next year he did the same in Chennai, Delhi and Mumbai. Not long after the half Ironman in Bahrain, Joby acquired a new road bike – a Focus. He complemented the purchase with accessories sent him by supportive clients in the US (in his narrative, clients supportive of his interest in the triathlon are a fortunate occurrence, more than once). It was time to try a full Ironman. He set his eyes on the Florida Ironman of November 8, 2017. For the full Ironman distances are longer. The swimming spanned 3.86 kilometers, cycling – 180.2 kilometers and running – a full marathon. Training commenced six months in advance. This time, Joby had Ironman focused-company for training. Shiva Subramanian is an IT engineer, who as of 2018, worked with Cognizant Technology Solutions at their Kochi office. He hails from Kalloorani, a village in Tamil Nadu’s Virudhunagar district. In his school and college days, Shiva was a keen swimmer. He was good enough at the sport to represent Madurai Division at state level swimming competitions. After becoming an IT engineer, Shiva joined Wipro, eventually moving to Kochi. In 2015, at a ten kilometer-run organized by Wipro, he discovered his running legs; thanks to other runners he met, he also discovered Soles of Cochin. He started going out with the group. When Joby’s half Ironman journey unfolded at Soles, it inspired Shiva and provoked his curiosity. He was a good swimmer but in the years gone by when he had been a competitive swimmer, all focus had been on speed. Endurance; how good can I be at it? – That ate his curiosity. Shiva decided to embark on his own journey to Ironman. 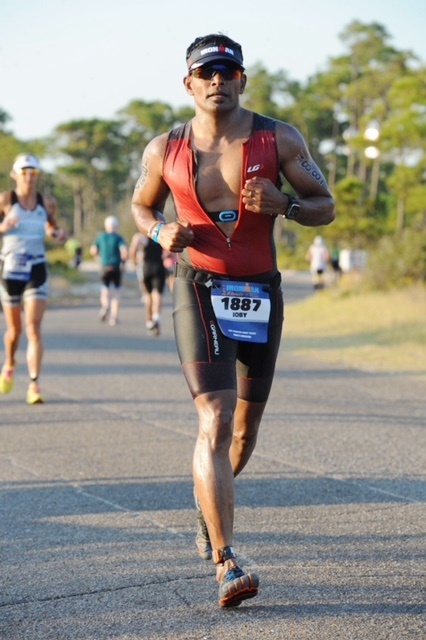 When the Florida Ironman set in as Joby’s next goal, Shiva became his training partner. “ A training partner is important. Having someone along helps break the mental inertia,’’ Joby said. Training started at 4 AM. Monday was reserved for long bicycle rides from Edappally in Kochi to Alappuzha and back; a distance of 100-110 kilometers. Tuesday featured a 60 kilometer-bike ride and a 10 kilometer-run. Wednesday saw the duo swimming (one Wednesday they swam long distance; the next Wednesday, they did interval training in swimming). Thursday was spent running; usually hill runs with Soles of Cochin around the campus of Cochin University of Science and Technology (CUSAT) in Thrikkakara. Friday saw them back to long rides on the bike (here too variation with interval training prevailed). Saturday was dedicated to sea swimming; the Florida Ironman entailed open water swimming in the sea. Given its proximity to backwaters and the sea, swimming may seem commonplace and easily done in Kerala. Fact is – it was, when pressure on land was less, the water of its backwaters and rivers was cleaner and many traditional homes had access to sizable ponds that served as captive swimming pools. Kerala is a narrow state. It may have successfully contained population growth rate. But that doesn’t mean population in absolute terms has remained stagnant. Growing population, high density of population and impact of human activity has affected the quality of water in Kerala’s rivers and lagoons. Hunger for real estate has also meant hundreds of those old ponds covered up and lost; it has even meant loss of traditional farm land. Today, beneath that canopy of green which still graces the state, Kerala is consumerist and largely urban; quite different from how it must have felt like 50 or 60 years ago. For their Wednesday swim, Joby and Shiva first tried the backwaters of Poothotta, approximately 20 kilometers from Ernakulam. But they found the water quality to be bad. So they shifted to swimming in the Periyar River; the spot they chose was Manappuram in Aluva. In a big river, the water is at least flowing; effluents – if any – don’t linger. They identified a half kilometer-stretch which they could repeat as laps. One advantage of swimming in a major river that is flowing to meet the sea is that if you do your swimming as laps, on the return lap you are swimming against the current adding thus to overall work out. Still, neither river nor backwater can fully substitute conditions at sea. To become good at sea swimming one has to do just that. 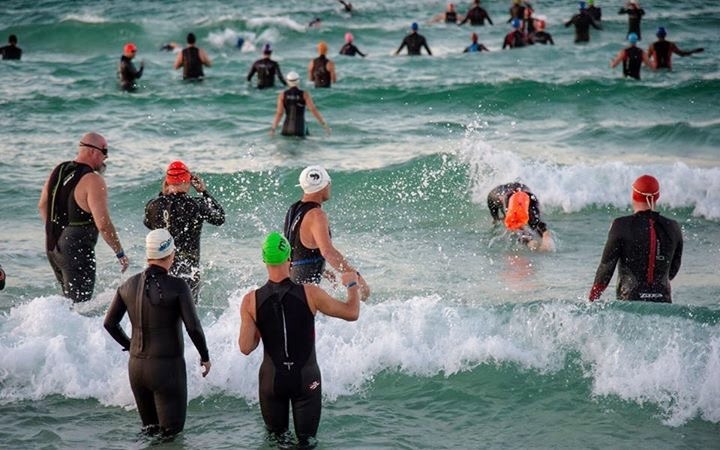 In the transition from the Bahrain Half Ironman to the full Ironman in Florida, there was a change in character to the component of open water swimming happening. In Bahrain, the swimming had been in a protected bay; in Florida, it would be sea. This couldn’t be ignored. Given they were not expert at sea swimming, Shiva and Joby decided to be careful in their training at Kochi. They reasoned that one of the angles to address while learning sea swimming, would be – how to handle an emergency should there be one. After all, you are some distance from land. Someone who knows the sea, alongside, would be helpful. It is now ten years since Prakashan, who hails from Varapuzha, has been a lifeguard at Cherai beach. Cherai is some 25 kilometers away from Kochi’s city center. Prakashan has taught others to swim although never for a project like an Ironman event. According to him, Joby and Shiva heard of him through a common friend; they first met at Munambam. 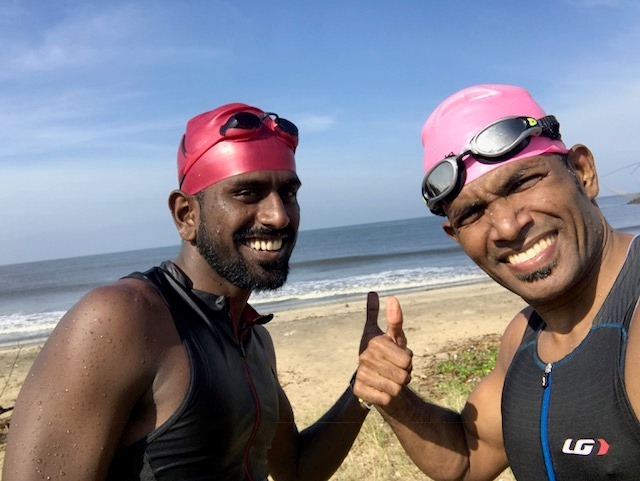 The duo apprised Prakashan of their need to be good at sea swimming for the Ironman event. “ They used to come to Cherai every Saturday morning by 6 AM. Then we would go about a kilometer out to sea and swim laps. The training would usually go on for three hours; we would wind up by 9 AM,’’ Prakashan recalled. While the duo swam, the lifeguard kept watch, moving alongside the swimmers on his surf board; he would lie on it and paddle with his hands. The surf board also served to carry a couple of bottles of water for hydration at sea. According to Joby, Kerala’s warm and humid conditions caused dehydration pretty fast. When monsoon arrived and Kochi disappeared behind the season’s veil of rain, Joby resorted to training at home. For cycling, he had special trainers – dispatched from the US by his clients – installed. Typically, for Joby, cycling is the most challenging discipline. He attributes that to Kochi not being a great place to train in cycling given the city’s narrow roads, traffic and inadequate street lights. “ If you are out cycling very early in the morning, then the hours till sunrise can be difficult for want of street lights. Once the sun is up, your next problem is growing traffic,’’ he said. As the Ironman event drew close, his clients in the US came forward to book Joby’s accommodation. November 2017, in Florida, both swimming and cycling went off well. Unexpectedly, the challenge happened in running. At the 25 kilometer-mark of the full marathon, Joby felt quite tired. The last 10-12 kilometers went off very slowly. He completed the full marathon in 4:44. Overall, he took 13 hours and 43 minutes to complete the Florida Ironman. A momentum had now set in. Joby started looking around for his next Ironman event. 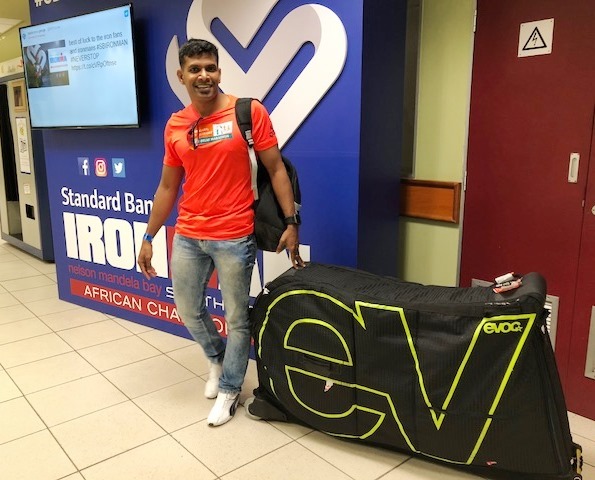 He decided on the one at Nelson Mandela Bay in South Africa; the decision was partly influenced by a Kochi based-IT company called Litmus Seven seeking visibility in South Africa and therefore agreeing to sponsor Joby. Training for the South Africa event required a strong component of hill training. He did that on the home trainer. “ It was a busy period at work. So overall preparations weren’t as structured as I would have liked it to be,’’ Joby said. The Ironman event, which happened on April 15, 2018, was fantastic. “ The course in South Africa was spectacular, especially in the biking segment’’ Joby said. He completed the full marathon part in 4:10 and the Ironman event overall, in 14 hours, 16 minutes. In the time since he started training for the triathlon, Shiva has steadily gained experience in the sport. 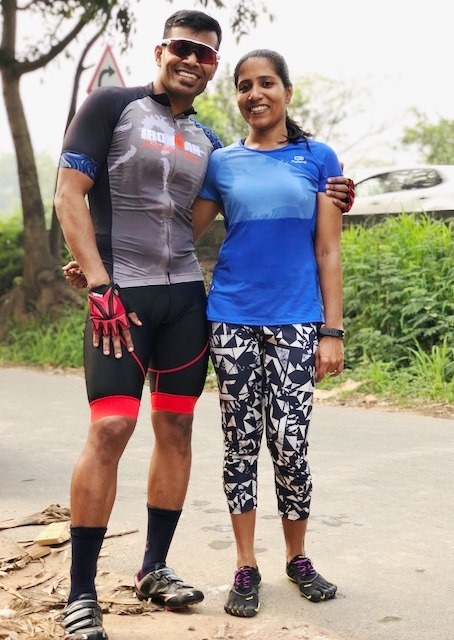 In 2016, he finished a triathlon featuring half Ironman distances in Chennai. In 2017, he completed a similar event in Mysore. Then, over that year and 2018, he completed two events in Goa featuring distances equivalent to the Olympic triathlon. For his next Ironman, Joby has selected the event at Langkawi, Malaysia. It is scheduled for November 2018. Shiva will also be there for it; he said that people at Soles have been very supportive of his desire to attempt an Ironman. Training began in May. Additionally, at the time of our chat, Joby had registered for full marathons in Hyderabad and Delhi. “ I would like to qualify for the Boston Marathon. Running is my strongest discipline,’’ he said.